Today most Interactive Response Technology (IRT) vendors have developed modern, configurable systems and much has been written about Agile development and delivery methodology as well as faster builds that improve system quality, reduce risk and simplify validation requirements. These system developments over the past several years have certainly brought many benefits to Randomization and Trial Supply Management (RTSM) delivered on IRT. Interestingly, though, while some eClinical technologies, such as Electronic Data Capture (EDC), are readily brought in house by biopharma companies and Contract Research Organizations (CROs), IRT is rarely “tech transferred” by comparison. Instead pharma companies generally seek IRT vendor relationships to ensure high quality builds that meet their needs and avoid the potential pitfalls associated with RTSM. 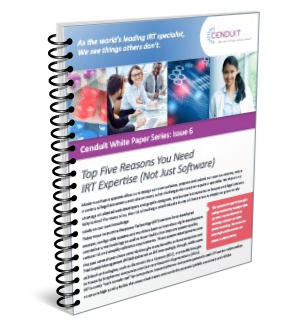 Download our paper to learn about the many areas where an IRT specialist can add great value to a study.